Are you a child of the 80s, or just one who grew up loving all of the 80s cartoons? They just don’t make cartoons like that anymore, and I’d argue they probably won’t ever again — heck, they’ve tried! While networks (and movie studios) have tried in recent years to revive some of the old 80s cartoons, nothing new really compares. While there’s no “best 80s cartoons” list that everyone will agree on, I’m going to break down my five top picks for 80s girls’ cartoons and 80s boys’ cartoons, and then follow it up with a list of other cartoons from the 80s. See if they spark any memories, and then share your favorite 80s cartoons with us in the comments! I don’t remember a lot about the Lady Lovely Locks cartoon, but I remember that I just had to have the toys and for some reason the dolls’ hair always seemed insanely long (then again, the hair was kind of a focal point). But they were cute. They had pretty dresses. And they had those cute little Pixietails. For a little girl in the 80s, what wasn’t to love? While I can’t say My Little Pony was necessarily one of my favorite 80s cartoon to watch, you have to admit they sure knew how to get little girls (and their parents) to buy toys. They could have created an infinite line of pony toys — change a color here, alter a size there — and we would have kept buying. Heck, we did! The cartoons themselves were cute, although I always found Megan to be a bit on the obnoxious side. The My Little Pony movies were always better than the cartoons, but the quality was generally pretty similar. To this day I still love the characters of Catrina (one of the villans) and the bushwillies. I mean, come on, they were even cuter than the ponies! My Little Pony is one of those 80 cartoons for girls that got a resurgence recently. While I haven’t seen new cartoons, I have seen the toys. This is one case where they didn’t mess with an 80s classic too much either — the new pony toys reminded me quite a bit of the originals. I loved this show. To this day though, I’m really not sure why. Maybe it was the contrast of the bright colors of the heroes combined with the more dismal settings in some of the stories. Maybe it was that I liked strong female lead characters (not that she was the strongest). Or maybe I just really, really wanted a horse like Starlite who could gallup through the sky on a rainbow. You tell me. 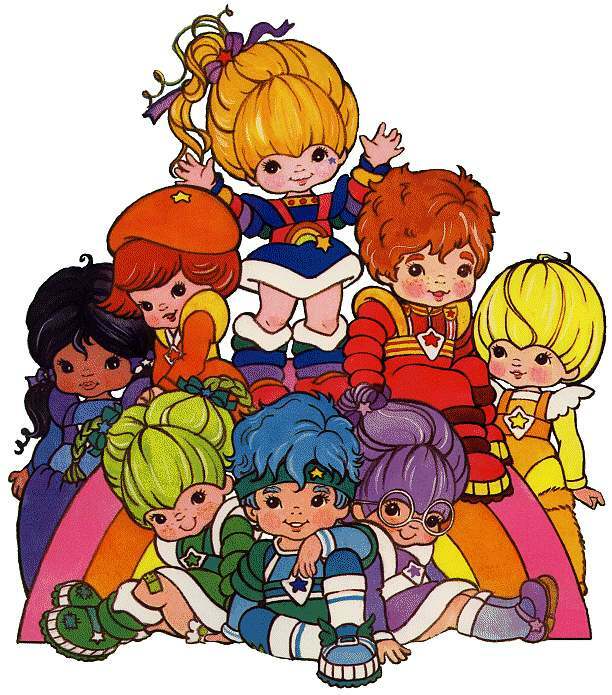 As much as I loved Rainbow Brite, I’m thrilled that it never got a full-scale update. I don’t recall a new cartoon version, but a few years ago they did try to bring back the show’s toys. They even kept them somewhat true to the originals. 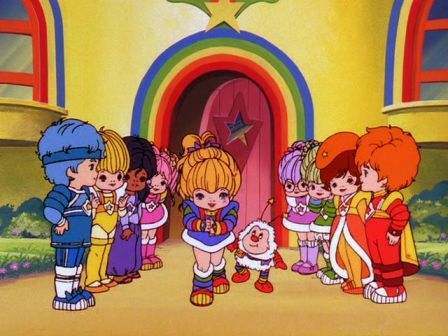 But Rainbow Brite is one 80s cartoon better left in the 80s. I wanted to make Strawberry Shortcake my number one pick for the top 80s cartoons for girls. I really did. But they killed it for me when they brought it back a few years ago. The updated animation was atrocious compared to the original (of course I’m biased). The only updated show they made a bigger disgrace of recently was The Care Bears (have you seen the awful 3D animation on some of those things?). I remember having the old records with the music, and just loving all of the characters of this one. I had the sheet set, a nightgown (I want to say a night cap too), and of course the dolls. I even made my mom make me a Strawberry Shortcake pillow for the bed. I was obsessed (but I’ll take being obsessed with an 80s cartoon over a modern one any day). Okay. 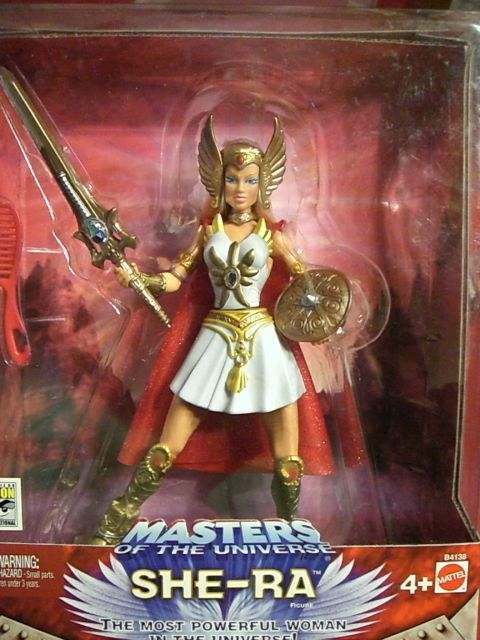 If He-Man was the “master of the universe,” then his sister She-Ra was the master (or mistress) of marketing. I don’t even know how we managed to store all of the She-Ra toys they released, but we bought them, played with them until they were falling apart, and bought some more! Sure, She-Ra was a bit on the corny side — okay, very. But we loved it. 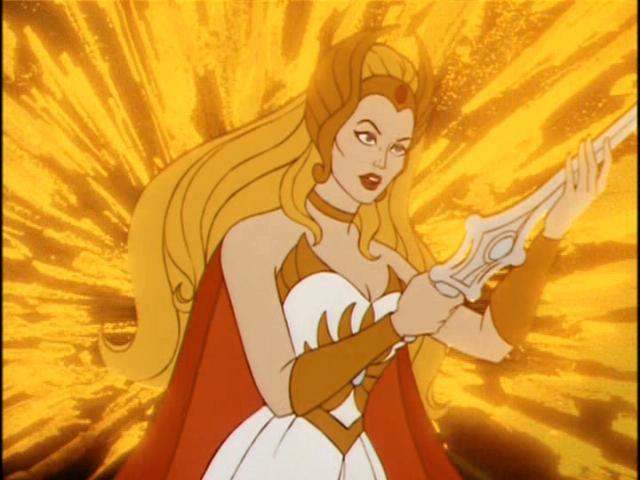 We had our fill of cute, soft, and fluffy and She-Ra gave us a more empowered female superhero-style character to idolize. And for that, she gets my top pick of the 80s cartoons for girls. I know my top picks may not be yours, so here are some other great 80s cartoons for girls. Let us know why (or if) you loved them! While I may not have grown up as a boy in the 80s, I did grow up with two brothers and two male cousins around the same age, so I’ve seen more 80s cartoons for boys (and their toys!) than I care to remember. Just like with the 80s cartoons for girls, I know readers are going to have their own favorites so if you don’t see them here feel free to share them in the comments! I won’t pretend to remember this cartoon well, but I remember the boys being obsessed with it, and constantly playing with their little G.I. Joe dolls (I mean “action figures”). It’s the new found interest and the upcoming G.I. Joe film that edged this boys’ 80s cartoon onto our top five list. I do remember watching this show with the boys growing up. For the most part I found the characters a bit disturbing (maybe it was just a girl thing), but I did love annoying little Snarf. This was one of those cartoons that really came to represent the animated style of the 80s to me (not to mention that I love most cartoons put together by Rankin-Bass). With that in mind, I’ll probably avoid the pending resurgence — said to be a CGI movie due out in 2010. I’m almost embarrassed to admit it, but okay, I really did like this show! This was one my brothers and I could agree on, although I can’t tell you why. Being a late 80s cartoon, the animation style was a bit different than some of the older ones. Maybe that’s what captivated me. Or maybe the idea of martial arts-loving reptiles was just cute to me… at the time. While I haven’t seen the most recent TMNT film, this is yet another 80s cartoon for boys that made it to the limelight a second time (or do we want to consider that a third, given the older films?). What can I say? This is one of those 80s cartoons I have a warm spot for. As for the intro video above, I apologize for the fact that it’s shaky and literally someone filming their television screen. But it was the only true original version I could find for you (others were all European edits making them the “Teenage Mutant Hero Turtles” because they censored out “Ninja”). He-Man may not rank as highly on this list as his sister did as my top 80s cartoon for girls, but number two isn’t too shabby! This was another boys’ cartoon that I didn’t mind watching. Okay, so the whole “by the power of Grayskull” bit is kind of cheesy, but then again in the 80s, what wasn’t? I have to admit though — I was always secretly rooting for Skeletor. Let’s say I’m ranking Transformers number one for the sake of the peanut gallery. I can’t really grasp the fascination with robots turning into cars and such myself, but the show seemed to captivate the imagination of little boys everywhere (and sell a lot of toys to boot!). I remember sitting in a movie theater watching previews pretty long before the first recent Transformers film came out. It was a superhero movie, so as you can imagine the theater was filled with young testosterone. Then a preview came on. A vague one — it must have been the first. I had no idea what the preview was supposed to be for. The men in the theater did. You could feel the excitement. It was funny and disturbing at the same time. But needless to say, they wanted their Transformers fix then, and I’m happy to give it to them here too. Not satisfed with the top 80s cartoons for boys listed here? See if any of these strike your fancy. Not all of the 80s cartoons we got to know and love really fit under the boys’ or girls’ labels. There were plenty of shows loved (and not so loved) by both sexes alike. So I’m going to leave you with a list of additional 80s cartoons to look back on. Reminisce away! Tell us about your favorite 80s cartoons (or even let us know your own top ten picks) by leaving a comment below! Disclaimer: All images, photos, screenshots, and show intro video clips are believed to be covered by fair use rights under U.S. copyright law, being used for the purpose of editorial illustration / identification in the context of reviews or critiques. 15 Most Bizarre Home-Made Products: Cute or Not? The best ever cartoon has been the American Presidents who are played by the Neocon Zionists. I was going to say “Dangermouse” but I think I have to agree with Joe. Voltron with the lions only. A lot missing here :’o egad! I forgot all about Teddy Ruxpin having a show. I remember someone in my family having one of those bears though (I seem to remember them being a bit obnoxious, but I can’t remember why – maybe it talked?). If anyone’s interested http://www.Hulu.com has a few available to be watched online (legally) for free. I believe you have to be in the U.S. to access the site though. They have He-man, She-ra, and The Mysterious Cities of Gold right now. If you subscribe to Netflix and have the “watch instantly” feature, the Care Bears 2 movie (from ’86) is up there. I put it on today just because I don’t think I’ve ever seen it. Man, I miss the 80s animation! 🙂 They may have more. That’s all I noticed so far though. Hey Do you remember the vartoon movie where there is this orphan girl with her white kitten that accidently swallows a gem of a princess, So that all her soldiers keeps chasing the gal so she can kill the cat and retrieve the gem or maybe its a ring dont remember.. And how a mysterious masked prince who keeps saving the girl though she hates the prince who is a redhead.. Do you remember the name of the cartoon… I just wasnt able to complete it and it always made me sad. I have been searching acouple years for this any answers? im trying to remember a cartoon in the 80’s it had to do with a flying circus anybody got any idea what its called? email please [email protected] thanks alot. I too have been looking for a tv show that I remember watching as a child that was about a flying circus and after years of looking I found the name of the show that I was looking for. Perhaps it is the same show you are looking for as well. It was called Dumbo’s Flying Circus. Holly crap!!!! you just ended a (better part of a) 20 year search for this cartoon. Honestly I was starting to think I made it up in my head. NOOOO one knew what the heck I was talking about. I had broke both my legs at the time this cartoon had came out (dumb kid stuff) and this was one of my favorite shows. However for the life of me I just couldn’t remember if it was ‘space sheriffs’ or ‘space rangers’? I did remember the horses which keep me on the western side of the show. Other then that, dead ends. thanks you, really made my day. It’s a shame you haven’t mentioned “The Real Ghostbusters”, “The Raccoons”, “Trap Door” or “Visionaries – Knights of the Magical Light” anywhere.. otherwise GOOD CALLS!!! Star Blazers was my fav, Voltron was a close second. Transformers were good while Go-Bots sucked bad. Not sure if this was 70’s or 80’s…but what about “Jamie and the Magic Torch”…a bit psychadelic like the Beatles “Yellow Submarine” film. Well some left out that were good. Some might not had been 80’s cartoons but early 90’s. Above link is of cartoons of the 80’s not sure how complete it is but looks it to me. This is good list, reminds me of years or decades gone by. I would have to say I agree with the list, the boys list at least. But you have missed out one of my favourites M.A.S.K. I think it’s only a matter of time before a M.A.S.K. movie is made. WOO HOO. Jim Henson’s Muppet Babies was another that got watched in my house growing up. I only had sisters so it tended to be shows that were either middle of the road or aimed at girls. All the more reason I stayed in my room with lego most of the time, there is only so many times you can watch a little pony think the world is ending because she got mud on her. I do recall having some toys from Brave Star, which was an oddly mixed future western cartoon. you whom said early’s 90’s show this is for the 80’s stuff not early 90’s. and yes to you whom asked there was a teddy ruxpin toy and it talked. What about the ones where all the different cartoon “stars” had the car races? I was a girl in the 80’s, but HATED most of the “girlie” cartoons. I was a tomboy and loved it! I loved the shows like “Battle of the Planets” and “Superfriends” (mostly because it had Batman in it! ), and “Batman” and “Spiderman”, though I think the last two were reruns from the 70’s. Other cartoons I’m surprised no one has mentioned yet are “Jem” and “Josie and the Pussycats”. I know “Jem” was in the 80’s, though “Josie” was quite possibly from the 70’s. Thanks all – some good suggestions here. Keep on adding them (but make sure they’re actually 80s cartoons and not 70s or early 90s, which don’t really apply here). One I’m surprised no one mentioned is actually The Simpsons (which I believe started in ’89, and might be the only 80s cartoon still in production — if you know of others that are, share them here). Ok, this might sound a little weird, but i remember this cartoon movie when i was a kid (not sure exactly the decade- but probably 80s). I can NOT think of the title for the life of me, and i’ve tried to google, with no success). The plot is a little fuzzy – but I’m pretty sure it had something to do with cartoon robots on a mission or something – they traveled in like heart shaped rainbow wormholes or something – and also, there was something with chalkboard eraser clapping. I know this sounds rather out there, but if this sounds familiar to anyone, please reply! I remember the eraser clapping! And the robots! What is the name! I remember this movie!!!!!! However I cannot think of the title either. Did anyone Ever figure this out? Sadly, not yet. 🙁 If anyone remembers any other details about it, we might be able to figure it out. It doesn’t sound familiar to me, and I just did a search which turned up nothing (except someone looking for the same thing, but no accurate responses yet). 🙁 I have a friend I could ask when I talk to him next, so if he knows I’ll come back and post it. Hopefully it won’t be one of those “lost” relics of the time that no one can come up with. I rember this cartoon movie that was only on around christmas time i think in 88 and 89 but I’m not 100% sure and I’m not sure on my attempt at spelling please let me know if you recall it or not and if you know correct spelling and such. It was called moosletoe(not sure 100% on spelling) but was him haven adventures around christmas time and I belive he had a girl friend moose called misletoe(again not sure on spelling)at 1 time I dont remember it all but that’s what I remember. I know I had a stuff animal of each of them in the 80’s. Hope some one can asure me I’m not crazy. i cant believe no one said FRAGGLE ROCK!!!!!!!!!! if someone did i didnt see it so i had to add it!! there’s a cartoon late 80’s, involving cute little animal characters possibly in space, wearing headbands with a jewel in the centre? Cant for the life of me think what it was, and its driving my friend and i crazy!!! HELP! Styled similarly to my little pony and care bears…but with darker tones? hi siu . i think i knom the cartoon you are looking for SPACE KIDETTES ??? hope i helped thay are on youtube on youtube look on ”fondmemories” and the other one is mybe PAW PAW BEARS but there not in space. Maybe ur talking about Moon Dreamers? MOON DREAMERS!!! i too have been trying to figure this out for years! thanks! Does anyone remember what shows they watched in the morning right before they went to grade school? I was just reflecting on them and wanted to know what ones you guys watched. I remember watching C.O.P.S and woody woodpecker show I also remember Dennis the Menise was on in the morning but I think it came one when I had to be at school on time. I watched Captain Planet bright and early every morning for a looong time. Pixieberg I thing the show you’re on about is Bucky O’Hare. Hey, Mike, I know this is a long shot, and that you probably won’t ever see this reply. But I’m trying to track down a show that I only vaguely remember from childhood. I’m thinking it might have been called Starbrite, and you are the only person I’ve found on the internet to mention it! If you see this and remember the show well enough, could you tell me what it was about? Thank you! Wow. There are a lot here I’ve never even heard of. A few ring bells though. I do remember Beetlejuice and I very vaguely remember Camp Candy. Starbrite sounds strangely familiar, but for the life of me I can’t picture was it was! What about Kissy Fur & Super Ted? Oh yeah, & Eureeka’s Castle! No one’s mentioned The Littles. They looked like little humans/mice. I remember a cartoon about girls who lived in space. One of them rode a white bear. I even had the toys of these. I cannot remember what it’s called. Ring any bells? I have been searching for the name of a cartoon. It involved little girls who lived in space, I think. One rode a white bear and another rode a lion with wings. I know I’m not making it up because I still have the toys at my parents house. The doll version came with a plastic diamond necklace for kids to wear. Anyone remember this? does anybody remember a western themed cartoon with bulls? what was it called? here is a few i remember voltron defender of the universe,hong kong phooey, the smurfs,inspector gadget,snoopy,betty boo,duck tales,chip & dale rescue rangers,bananaman,alvin & chipmunks, around the world with willy fog,astro boy,battle of the planets,captain planet & the planeteers,dogtanian & the 3 muskerhounds,dungens & dragons,ewoks,garfield,the get along gang,the real ghost busters,james the cat,jimbo & the jets,penny crayon,the raggy dolls,the raccoons,the shoe people,trap door,ulysses, and i think ox tails was late 80’s and there was another one but i can’t remember it was a boy with a magic torch and he lighted it up under his bed can any body remember the name of this. well thats all i can think off besides the ones that people have already said. Laura, I think it might be MoonDreamers you’re thinking of? I have been searching for episodes of Angry Beavers and I Am Weasel online but cant find them. I tried youtube but there arent many. Any suggestions? Nice list Jennifer, I remember a lot of these and a lot of the ones people have been mentioning really bring back memories of my childhood. I’m trying to remember one that whenever I mention it to other people my age I get the blankest looks. I only vaguely remember it myself, but it had something to do with Earth in the future and the villain rode around in this machine that produced a fog or cloud that would decay everything that passed through it. I guess he had been riding around for a while around the earth or something, because a lot of society was falling apart. A person couldn’t even approach his vehicle because I think without protection it would dissolve you. I just mainly remember someone (the hero?) walking around and going into a library, picking up a book, it disintegrating and him lamenting all the loss of human knowledge. Sound familiar to anyone? I have no idea when it broadcast or if this was just one episode of another show? Please help, I’ve been trying to figure this our for a long time because the story and characters seemed so interesting. Unfortunately the show or episode you’re describing doesn’t sound familiar to me at all and a quick search didn’t turn up anything that sounded like a fit. 🙁 Hopefully one of our readers was also a fan of the show and will be able to share some more information. HEY! oh my gosh me and my sister are completely stumped by the 3 girls riding horses show too! if you find out what its called PLEASE let me know!!!! we are literally sitting here trying to remember the name! it was very random that we came across your post! but also surprisingly funny! THANKS! im dying to know what the one with the 3 girls and the horses is called, its been driving me crazy! please let me know if you figure it out! actually my friend just found it, its called Princess Gwenevere and the Jewel Riders! i dont know what year it was made…but i loved Dark Crystal..even though it was mainly puppets and not so much a cartoon..but it is one of my fav movies..
bananaman. when eric became bananaman! super ted. battle of the planets. captain caveman.sport billy.mighty mouse. batfink. wuzzles. another with 3 super heroes in, iceman,fire and an orange rock type figure? not sure title? I loved She-ra & Beetlejuice cartoon–but I can’t believe no one’s mentioned Jem! She was “totally outragous”! I rememb a cartoon set in space with aliens, and not sure if there was a pizza shop or cafe? I think i remember tge lead having a green face but looked human? I watchedthis all the time but cannot remember the name?! I remember this too- I think it had a similar feel to “Aahh real monsters” and “Galaxy High” but I don’t think it was either of these- the pizza restaurant really sticks out in my mind and it’s driving me mad that I can’t find any information on it anywhere! oh my heck moon dreamers. I still have my glow in the dark toys. loved it. does anyone remember a show set on a boat in space? the crew was people, rather than animals, and all I remember is that the chef was crazy. someone help me. whenever I talk about this people look at me like I’m nuts. Could it be the Captain Harlock one maybe? i might just be a sucker for nostalgia but i loved the transformer cartoons better than the film version. There was a nice cartoon about a small girl who can change her self into a bog girl, after helping people she become small girl again. it’s a very prity cartoon. i can’t remember the name. I am trying to remember the name of a cartoon that had a cat that painted. The background was always white, the cat always wore overalls and I remember he usually carried a bucket of paint and brush. The colours he used were bright. The cat would paint for his friends…he would sometimes just pull a ladder out from nowhere. Oh and at the end of the theme song you would here ‘meeeeoooowwwww! Meeeeeeoooooowwwww!’ Please help me, I’m going insane! ‘LAURA’ I totally remember that cartoon with the cat, ive been searching for ages to try and find out what its called. I remember that whatever the cat painted could become real and the music was really gentle like glockenspiel type – i absolutely loved it as a wee un, it really made a creative impact! please please someone help us, i would love my kids to watch this! Henry’s Cat!! Loved it too!! I’m a guy but, in many ways, I was like a girl growing up, I had a girls name and I loved Rainbow Brite and Strawberry Shortcake, I still have my Rainbow Brite. I did also love He-Man, She-Ra, Transformers, G.I. Joe, Jem, Superfriends, and the Spider-Woman cartoon as well as Spider-Man and his Amazing Friends, I loved Firestar most of all. Also Dungeons and Dragons. Really, as a kid, I loved most things, even Gilligan’s Planet. My first cartoon memory though is Star Blazers. Don’t forget Galaxy High! So many greats and while I am a child of the 80s, we experienced cartoon from the 70s, 60s, 50s, 40s and 30s in our childhood too. I grew up with Looney Tunes, Scooby-Doo, Disney, Woody Woodpecker, Heckle & Jeckle, Popeye, Hucklebery Hound, Rocky & Bullwinkle, Underdog,Betty Boop, Popeye, and Koko the Clown (on PBS). Also the Educational programs, Electric Company, Sesame Street, Square One and my favorite Math Patrol which had live action and animated segments. Math Patrol featured this guy named Sidney who was a spy who’s spy costume was a Kangaroo suit in a blue trench coat. Does anyone remember fraggle rocks? yes i remember fregggle rock! does anyone remember a cartoon dont really rememeber the year. It had and little girl in it and her friend was an pink alien from space. Any one have any ideas caz its driving me crazy. I think this is the one that i have been looking for as well. does the little creature have magic powers like able to clean her room with the snap of a finger? I am looking for that one too! I think the alien had an elephant nose?? I have been looking all over the internet and cant find anything!! Sorry. I haven’t had any luck finding anything like that. 🙁 Hopefully another reader will remember it and be able to share the name. The Adventures of the Galaxy Rangers was a great series (and only 2-3 episodes that should have been skipped) that spans two volume set on DVD. Robotech should have been on the list, which was another great show! Do you mean Gobots? or maybe transformers the cartoon?! Those ar the only two i can think of.. Think I’ve got it. Try Telebugs on google images. This is definately the one I was trying to remember. What about the girl who was really a robot. I think he name was Teddy. Also what about a teenaggirl who talked to to her dad through a cystal thing o her nightstand. I’m trying to remember a girl superhero and she could “bend me, shape me, anyway you want to” and those lyrics were in the theme song. does anyone know the cartoon which has 3 girls and one of them are princess and each of them hold Moon, Sun,and Heart crystal to transform to a super power to fight the witch. Could it be Sailor Moon? I think you’re thinking of Princess Guinevere and the Jewel Riders. except it has a different name.. STARLA and the Jewel riders..? I must say a few very great shows were left off Adventures of Teddy Ruxpin, Duck Tales and JEM!! Can anyone tell me what the 80s cartoon was that had a girl who drove a flashy car, and had a sidekick robot and dog?? It almost sounds like Poochi. But I think that was just the dog and robot — the dog wrote an advice column or something. It might have been a special if not an ongoing series. Not sure if that’s what you’re thinking of, but I loved that as a kid. Does anyone remember a cartoon about a girl with a star on her face, she would turn into a rockstar or something like that? I can’t remember the name, anybodyyy??? JEM? she didn’t actually have a star on her face, just her eye make-up to look like it was. we dressed up as Jem and the holograms one year for Halloween. Anyone remeber a cartoon with an old man with a coat, a walking stick, a hat and a beared and never talking so you really could understand – and he had some kind of powers – like flying, and as far as I remember, his stick had some abilities to? Think he had a wife also – dont remember if he was some kind of spy nor old guy with powers – but cant find it on any lists or sites – dont remember if i saw it on Sky Channel or Super Channel back in the 80’s. But would really love if any1 remembers the name. Think his coat was green. Time of action in the cartoons was about the 80’s. He walked a little like Chaplin. No ideas what it could be?? I remember this cartoon. The old man didn’t have a beard but a big droopy white moustache and used to call his wife ‘sweet keeper of the cheque book’. It’s been driving me mad for ages trying to remember what it was called. Does anyone remember a cartoon about a pink robot? She was a very feminine looking robot. I don’t know if there were many episodes. That used to be one of my favorite cartoons and I can’t remember the name of it. I think it was on after 3:30 during the week not on Saturdays. I think there were a few other robots too but I just remember the pink one. Does she have red hair? Was she in love with a human male with blonde hair? Did she and other robots transform together? I’ve been trying to remember what this is for ages! At this point it could have been a dream mashup of dungeons and dragons, voltron and the mighty orbots. OMG OKAY SO for like a year ive been trying to remember this cartoon i watched over and over again when i was young! My memory of it is vauge but I remember it being of maybe a brother and a sister and a talking dog (i think it was talking) and they went on adventures one was in an areoplane and they had a suitcase. thats all i remember! THANK YOU! I’ll take the 80’s Transformers cartoons over the recent movies any day! True! Except the japanese episodes – got the Takara pack – and was really disappointed – its was to primitive and easy stories compared to the US versions of em. I have been trying to think of the name of the name of a cartoon which I think was Japanese anime, I watched it in the 80s. The main characters used to go around and find rainbow gems a different gem in every episode. They were very smart characters maybe they wore school uniforms?.. Defenitaly Not rainbow brite. Please help, I have been racking my brain and searching but I still can find it. Thanks! i can only think of sailor moon, JEM, or just Rainbow bite. UUUGH! This sounds kind of like what I’m looking for here too! I think they were named after gems, too. If you find out what it is, post it in here please! Why divide the shows as boys/girls shows? A bit unneccesary I think. Some of these may be a little bit earlier then 80. But, they are what I watch in Alameda,CA. I am not shocked this one did not make the list I know a lot of people who remember the show foggily but cant remember the name for any thing, but I loved it! It was Spartakus and the Sun Beneath the Sea. It used to come on right after the cities of gold. Hey, so there’s this cartoon I’ve been trying to remember. It might not even be a cartoon, but we had this book and there were I think 5 girls in space, maybe defending a planet/solar system and they were all named after jewels and they had really sweet outfits involving the colours of the gems they’re named after. I know there was one named Sapphire. (Definitely not thinking of Sailor Moon here, either). I know this is really vague, but if anyone can help me out it’d be greatly appreciated!! I can’t believe no one mentioned Beverly Hills Teens. I remember me and my friend would wake up early just to hear the theme song. I wish they would release this series on DVD. I hope someone could help me ! I’m looking for a cartonn from the 80’s, which was about a city of shoes, that was called “Shoeville” in France, which could be calle in english “Shoetown” or “Shoecity”, but I do not find anything about it… ?! I hope someone knows something about it ! Hi Aura. You’re thinking of Charmkins. 🙂 It was only one short cartoon movie rather than a series. It was on TV and VHS I believe. They created it to support tiny little charm toys that kids (mostly girls) would collect. It was one of my favorites, and I found it on YouTube at one point, so it’s online somewhere if you wanted to see it again. I haven’t been able to get my hands on a physical copy yet though, but if you’re interested, Ebay might have an old VHS version. I’m looking for an 80’s animated cartoon video, don’t think it was on TV, where a little dancing girl makes magic rainbows when she dances, she is captured by a man or wolf who wants her to dance for him and is put in a cage, there may involve an hourglass with flower petals counting down, anyway she ends up dancing herself free somehow on the rainbows, it’s in the style of Rainbow Brite but I don’t think it was a series, I know it’s obscure but any advice on where to look will be helpful, thanks! ive been looking for a cartoon movie since super channel was super channel, with the big star logo…i guess over 14 years now. it was a musical cartoon and weird. hard to explain… there was a guy driving somewhere and then he ends up at this weird place/building, then a woman sings, sounds kinda country-ish. and weird things start happening. i wish i knew more. it pops in my head every year and drives me crazy. its not a long cartoon, i dont think it is anyway. When I was a kid I used to watch an anime series about a girl who lived alone in a house on the moon. She was the only living thing on the moon as far as I can remember and sometimes she took trips down to earth, but she was always alone at the end of each episode. I have no idea what it was about or what the name of the show was since I was too young to understand english at the time (I’m Swedish), I just remember that I liked it and would so much like to see it again!!!!! I know this is extremely vague, but I used to watch thie show or movie all the time when I was younger. The only part I remember is a blonde girl floating on something through a tunnel and robot models lined up down the sides of the tunnel. There also was part where there were strawberries inside bubbles, and the girl would pop them to eat the strawberries. I have been trying to find the name of it forever, and I know its vague, but any help would be great!! please help im desperate. I have been trying to remember for the longest about a cartoon?? or maybe a movie kinda cartoon. i have vague memories about this. i can only remember something about traveling into another land through a magic mirror! i think the story begins with a girl saying something to the mirror and its not yet cartoonated..after she follows into the other world through the mirror she becomes cartoon i believe or meets with cartoon type friend?? need your help please! are you thinking about beetlejuice? nop not it! but thanks! another thing i remember is that the mirror was located behind the door of her room! You’re mentioning liveaction and cartoons. That makes me wonder if you’re thinking about Huggabunch. It was all liveaction, but when the girl goes through the mirror she meets these puppet-style friends. It’s about her trying to get some magic fruit from an evil queen that will save her grandmother, and the puppet characters help her (they love to be hugged). You don’t know how thankful I am for helping me J.M! Thanks a bunch! Yes, it is totally Hugga Bunch!! !My 15year search is finally over! Im defenitly going to see an episode of it! Just hope youtube has it. I don’t think there are multiple episodes though. I’m pretty sure it was just a TV movie. There were a lot of those back then, made to promote specific products (in this case the Hugga Bunch dolls). oh i forgot to mention 2 other cartoons that haven’t been mentioned and which i loved watching. My Pet Monster and Richie Rich! anyway he was look like spiderman..
hi! there was a superhero with a grey/green (i think) costume..he looked like spiderman.. he was something like a fly,dragonfly not sure.. also in the openining video there was a man watching on tv another man watching tv… any ideas?? plz!! the tick? that’s the only dragonfly like cartoon i know. but that is way to resent. no.. its not that.. actually i m not sure if it was dragonfly but anyway thanx for the reply..